Belgian Chocolate is considered to be the gourmet standard to which all other chocolate is measured. What makes Belgian Chocolate unique is the quality of ingredients and an almost fanatical adherence to Old World manufacturing techniques. Belgian Chocolate may be slightly more expensive, but those who have sampled it say there is no comparison between it and standard chocolate. As a gift or special indulgence, Belgian Chocolate is one product which lives up to its reputation for quality. The very best Belgian Chocolate is melted then installed into a health grade-stainless steel fountain which operates electrically. The heating element is controlled by a thermostat, when the motor is turned on it turns the auger (corkscrew). The chocolate is pushed up to the top where it will then flow down the tiers. What are the table requirements for the chocolate fountain? 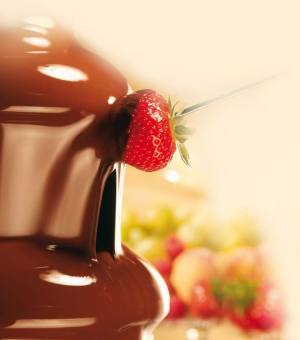 The chocolate fountain weights approximately 35kilos when full; a level, sturdy table is a must. If it is not level the chocolate will not flow properly. The chocolate fountains require power from a standard power point to operate. What can you dip in a fountain? 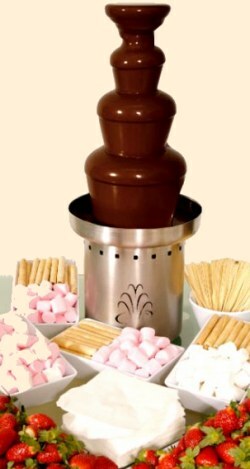 We can discuss any ideas you may have for your chocolate fountain. Who provides the dipping food? 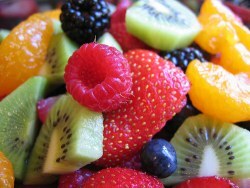 You provide the dipping food to suit your requirements. 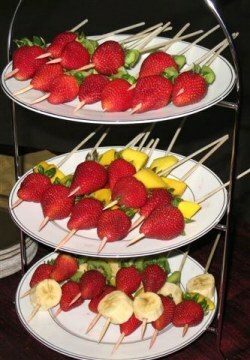 Some of our packages have marshmallows and/or wafers included however all other dipping food is provided the customer. What happens to the left over chocolate? It's yours to keep and enjoy. You will need to place any unused melted chocolate in a container on completion of your hire prior to it returning to solid form. Unfortunately you cannot run the fountain outdoors. Outside temperature plays an important factor on the flowing consistency of the chocolate; in addition even a slight breeze will blow the chocolate outside the fountain and onto everything around it. Little flying bugs tend to be very attracted to the chocolates sweet aroma as well. Do you deliver the chocolate fountain to us and at what cost? This is included in some DIY packages as part of our service for Newcastle areas only (within a 15km radius of the CBD). Once your booking is confirmed with your deposit we organise with you a schedule of delivery or pick up / collection or return. This is arranged for the day before your booking and the day after your booking to ensure a smooth hassle & stress free experience. If you are outside Newcastle a delivery fee will apply and return of the fountain is the responsibility of the customer the following day. A $200 refundable bond is required for all fountain hires Cleaning is included in all fountain hires. Is there a limit for use of the chocolate fountain, or can it run continuously? The fountains can run for up to 4.5hrs for the large fountain hires & 6.5hrs for the extra large fountain hires during your event. Is the chocolate fountain easy to clean? Cleaning is included in all our hires when the customer returns the fountain the following day so do not worry we are happy to take care of that for you. Yes, we require a 30% deposit at the time of booking. Orders are a first come first served basis. The balance of your payment is due at least 7 days prior to the scheduled date of your event. Email or phone us with a brief description on a package you are looking for or the name of one of our pre-packages listed and your event date. We will advise if your selected date is available and discuss any other details you require. Once you have finalised choosing your package you will need to complete our Rental Agreement, sign and return it. We require a 30% deposit to confirm your booking and lock your date in. If the rental agreement is not returned and deposit is not received 7 days from issue your booking will be deemed not required and offered as available to others. Once your deposit in paid and agreement signed your booking is locked in and yours. Any other questions please contact us and we would be happy to assist. Book your chocolate fountain today.